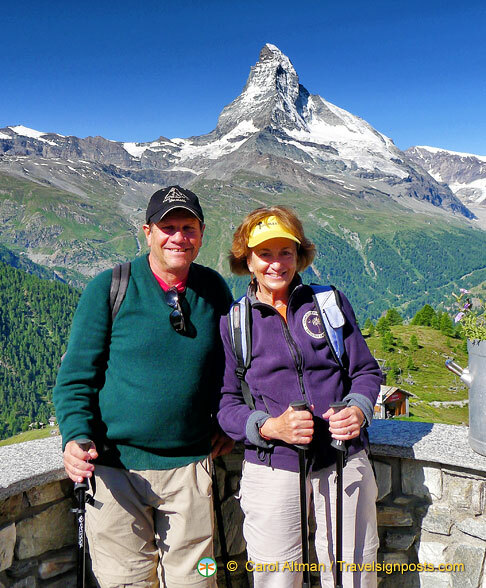 When I was invited to tag along as a journalist with Alpine Adventure Trails Tour on a two-week hike in the Swiss Alps, I was eager for my husband Mark to book the trip and come. Somehow he did not share my enthusiasm. “…climbs of 2,500 to 4,000 vertical feet…rugged..strenuous trails with advanced mountaineering options,” I quoted the brochure. “Yikes. We’ll break our legs, or our necks. 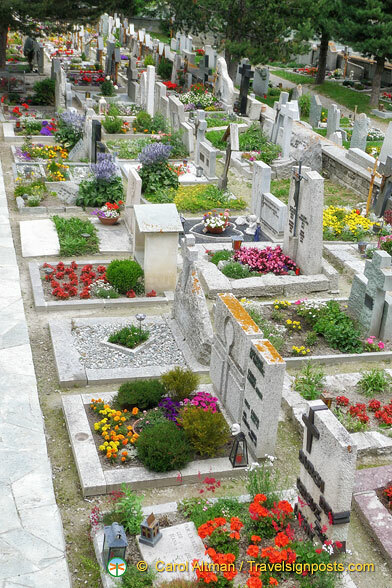 There’s actually a hikers’ cemetery in Zermatt? Good thing I already have a doctor’s appointment scheduled after we return. We’ll be so exhausted!” he said. “But July is a perfect time to go. It’s so hot in South Carolina,” I persisted. Now I was worried. In all of our many trips we had never travelled on a tour before. “And they’ll all be twenty years old, running up the mountains with GPS and pedometers. We’re 60! Another thing, last year they had to close the trails in Zermatt because of avalanches!” He was getting seriously worked up. “But on the other hand we wouldn’t have to do all of the planning and figure out the trails. I’ll never have to ask you ‘Are we lost?’” In all good marriages, the roles flip. Now he was the cheerleader. In the end I couldn’t resist the invitation. He came to protect me from avalanches. We packed a bunch of wool socks along with our misgivings and headed to Zürich to meet the group. 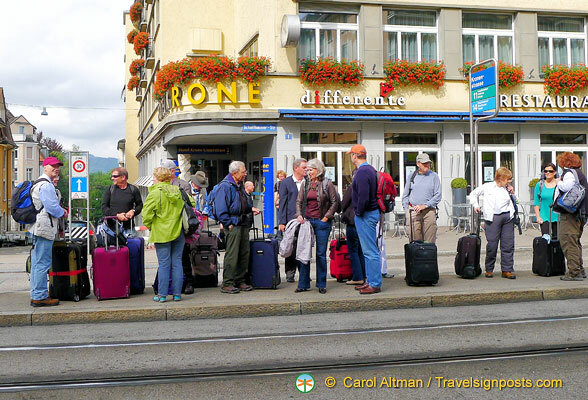 We checked out the other 20 hikers before boarding the train to Zermatt. “They don’t look too intimidating. There’s a few older than us. She looks scrawny. He can’t possibly walk very far…” Pure bravado. It worked well. Until we started hiking. Had we been on our own, this would have been where we would have turned around. But the threat of being called wimps made us trudge on. We reached Hotel Trift ninety minutes later where we collapsed at the picnic tables and took in the view: a mountain range of snow covered peaks. Waterfalls in the distance. Peels of cow bells drifted up like wind chimes. Somehow without electricity or running water, delicious rösti and surprisingly tasty hay soup (“We take the grass out before they serve it”) appeared. We quaffed sparkling apple cider and marvelled at our accomplishment. Peer pressure made us do it. After lunch the proprietor played an Alpine horn for us until he was interrupted by a helicopter landing nearby delivering his groceries. Amidst “story of my life” sorts of conversations, we made friends. The Canadians wanted to compare health care systems; favourite Bavarian beers were a hot topic; band-aids and moleskin were shared along with trail mix and chocolate. I complimented one woman on her beautiful complexion and learned her secret: a nightly application of Crisco. When we stopped at a beautiful Alpine lake just one day after meeting her, Barbara asked us to take a photo as she scattered her husband’s ashes in this picturesque place that they’d visited together. We discretely stepped away from the group and recited a Hebrew prayer as she flung the ashes into the wind, making us her new best friends. “I feel like I’ve joined a youth group, only they’re older,” Mark said. We had beefed up our exercise regimen to get ready for the trip but surprisingly it was the older hikers who inspired us by their endurance and vitality. Carl, Frank and Jane who were 74 to 84 years old often led the pack on even the hardest hikes. 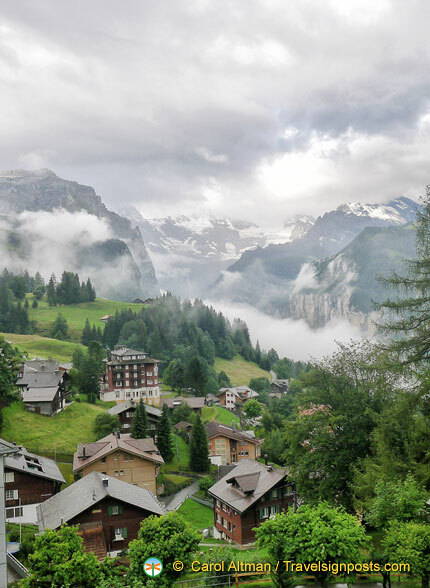 Woven throughout the trip were vivid insights into Switzerland. Cows go to camp, spending the summer getting fat in the valleys. Feather comforters (duvets) are so thick they feel like they have balloons inside. Trains are famously quiet and efficient but buying tickets is often on the honour system. Citizens help ensure no-one sneaks aboard and they might reprimand you if you put your feet on a seat. All dogs are required to go to obedience school. Even Matterhorn summit climbers are required to follow rules posted on the sign in the base camp: “Rules for everybody! Wake up call 3:30 AM. Start not before 3:50”. 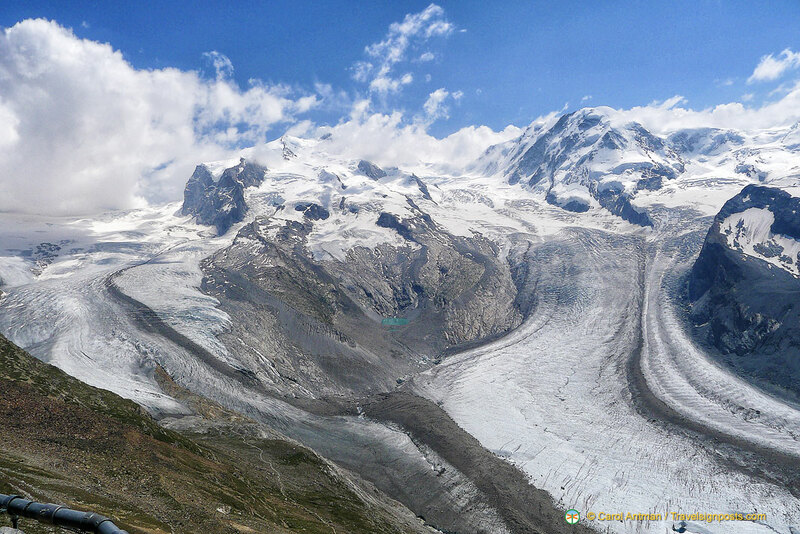 The hike to the Matterhorn base camp was the most seriously exhausting one of the trip. We had been so happy using our new hiking poles for the first two hours of trekking. But then our leader Lisa said “Put your poles away because now you will have to use your hands to pull yourselves along. Keep going and don’t look down.” “Really?” we said in unison. But step by step, hand over hand, we arrived at the most magnificent view of our lives. 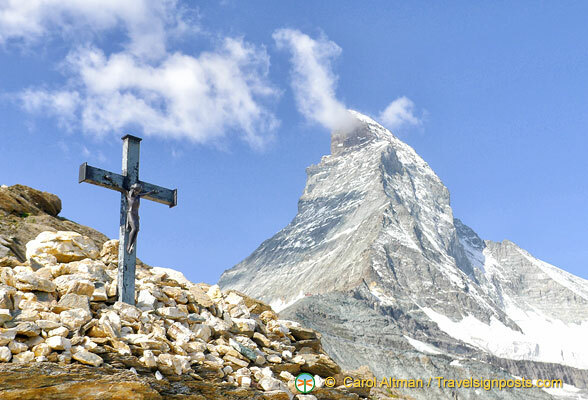 The Matterhorn summit towering above us, an endless expanse of glaciers and peaks below. At the base camp were about a dozen climbers who had summited that morning. I asked Kate Lewis how it had been. “At the beginning I was thinking ‘when is this going to get hard?’ Then near the top it did. I was not very prepared although I’m a mountain climber. This was only my second time wearing crampons.” She hiked with a guide from the lodge. “He saved my life several times. He had me on a rope. One time I fell on the snow and he caught me.” Maybe we were wimps after all. We have a photo of us beside a Swiss flagpole at the top of a snow covered mountain smiling, remarkably, after a long climb. It is more than our favourite souvenir because in the end, none of our misgivings were founded. We had no broken bones, the weather was variable but pleasant and the group was pretty good company. Well, maybe one doubt turned out to be true: we were exhausted. But the photo is a testimony to putting aside misgivings and climbing deliberately and determinately towards a far off but beautiful destination.